Why is folder config alone on top level, when pak128.prototype contains all the other files? 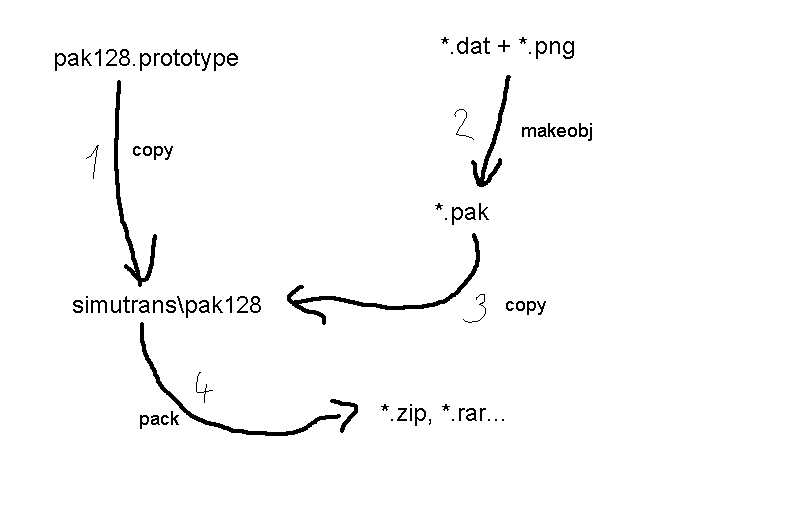 The scripts (pak128.bat and arbeite.sh) work to folder simutrans/pak128. The change of config files goes so fast, not only in the under folder needs to be changed. I don't understand. Why do you have to put that one folder apart and keep the other ones where they were? What is the difference? Wouldn't it be easier to copy them all? cd simutrans\pak128This browses to folder that doesn't exist in svn. echo j|del *.pakThat's for German version of Windows. I press 'a' and in English speaking countries it is probably 'y'. ohhh yes this is a pain in windows, there are many dendencies with language settings ... not on the 'y'/'j' (maybe for spanish 's') even date an time formats are differing. I changed the .bat, please test. Move "config" to pak128.prototype - yes/no? Why? We can have batch, python, makefile, shell script, ruby, perl, scons, vbscript, autotools ... Add your own if you want. But any script must start with data from svn and produce folder ready for play. Ok? True, but very simple. Older windows do not have some features (if, for). Even .sh is better. Werner told me pakmak does not work. Who else can confirm this? I get problem on startin it with my "nightly-Server". A Linux (Gentoo) System ..
BTW - Werner, Frank: what makeobj version do you use? I was thinking about the plan needed for 128 and realized the only item for next "serious" release is balancing vehicles again. The only bug (that is part of that) concerns TGV duplex – power/gear is not enough. Still it might be nice to get out something for people to play with 100.0, even if it's partially broken. How do you feel about a 1.4.3.1 release...? Not quite yet. I think we should at least work over the menus so that the tools for the new waytypes maglev and narrowgauge will be available and maybe provide bridges for powerlines now that they are possible. After that, the main issue will be updated balancing. Hm. For maglev and narrowgauge... what would we actually need? Just entries in the tabs, or even tracks and all that? I'd say we should provide at least the menus (along with new icons), so that people creating addons (like gauthier for maglev) and players who want to try these addons will find a prepared environment for it. Maybe we just create an entry and a toolbar with just a dummy icon that says something like "coming soon..." or so... Because with just a menu entry without content, the toolbar would be empty - and that would look like a bug to people. With such an icon everyone'd know what's up - and there's stuff to come one day. Because for the full program, we'd need tracks, electrification, bridges, tunnels, stations, signals... that will take quite a while - in any case, much too long to be suitable for a "quick" release like you mentioned. I am particularly concerned about numerous questions of the "where is maglev" kind. Something similar is happening with trolleybuses now. I included these wires just so that it's ultra-easier to get new vehicles into game, but so far it generated only a plethora of demands. I can't say I am particularly pleased with that development; it partially follows the double track or overtaking problem pattern (pretend for a moment it is one month back isidoro did nothing yet), and I don't intend to create situations where we get angry over things that could be prevented. This is just a very far-fetched prediction from my very personal feelings; right now I look at such post and think "bah, not again". But it might develop that way eventually, and I don't want to waste energy on truly artificial problems. It's not that I don't see the good that can come from it, only I take the pessimistic stance. Let's make a bet: we get trolleybuses (all infrastructure is there) in two months, you win. We don't, it's your job to deal with all the angry player threads. Note there is nothing in it for you, so better don't accept! Anyway. Looking at what is on the (better) German version of wiki, there seems to be a kind of deadlock. Normal track can be low and elevated, monorail too. But maglev? Does system_type apply to it as well? Because now we have official schwebebahn, which uses both system_types, and the maglevs from Timothy and Gauthier do so, too. It might be good to eventually ask for change so that everything "tracked" can have elevated version. If we had official narrowgauge in 128, I would envision it as something good for shorter distances, maybe when you have both industries on one screen. That might change over the course of years. If in very far future we have nothing to do and extend timeline into late 19th century, narrowgauge should at that time play a role similar to road vehicles - medium distances, light cost, mediocre characteristics. if my memory serves me right, there were hundreds of these small railways, often with one locomotive, and gradually disappeared with the advent of automobiles. Some of them are still preserved and operated by railway fans... so they should get ineffective around 1930-40 and eventually reappear later with not-totally-useless passenger revenues. Think connecting special buildings and such. I'll try my hand with powerline bridges. Wow, that was a long one. And I agree: maybe the menu should still wait. Sure as hell I won't accept that bet - I know how some people around here are. Now speaking of waytypes, and the wiki: I believe the wiki is not quite up-to-date on this page. Maglev and narrowgauge are new and completely independent waytypes, both with the full list of options. Including elvated ways, bridges, tunnels - the whole lot. I tested that with Maglev already. Should it not work with narrowgauge, that would be bug that prissi would surely try to remove a.s.a.p. - just as he did with the initially non-working crossings, so don't worry on that part. Also monorail and maglev cannot be mixed - at least not in current ST versions. It's either one or the other. gauthier has changed MLM stuff to be Maglev and the Schwebebahn should be (and stay) as a monorail variant, IMO. The use of narrowgauge... well it depends on country/culture. The scenario you described is true for Europe, I guess. However, in Japan for example, almost the complete railway network (except for the Shinkansen lines and some private companies) is run on narrowgauge tracks up to this day. But I guess for inclusion into the current pak128 style, what you described sounds better suited. Good to know the modern waytypes don't matter then. Schwebebahn of course stays what it is and where it is. Since there is already working maglev, albeit as addon, it should be accessible. That is sensible. I know about Japan's gauges. But I had in mind something different; those miniature trains with ridiculously small cars going some 30 km at most - from the forest to the sawmill or such. The attached picture shows better than words what I mean. With that, two pixels less can be about right. Well, for those one could probably just put the tracks 2 pixels closer together. So we might give raven's old NG tracks another look. Or, if we have a couple of weeks (or months), I might be able to convert some of my normal sized tracks for that... just kidding. Tracks are a lot of work, if you want them done right! Don't know when I started mine - I'm still not done! BUT... aren't we maybe "throwing away" a potentially useful waytype for this toy-like eye-candy stuff (of only limited use)? The trolley bus idea sounds good. Before I plunge into the depths of narrow gauge dispute, let me add that the trolleybus characteristics should basically apply also to underground trains (subway, metro, underground), if there are ever some. I don't really know. The plan involves obsoleting them with trucks, so the point has even double weight. As always, I skilfully withheld a few important pieces... Narrow gauge trains as pictured here would dominate the world in times preceding the current timeline, and this leaves lots of open possibilities. The big picture is - if we ever get more industry graphics, the industry line should start back then with small production and later increase, which will bring more money, except that then the "inflation" kicks prices of everything up. So, the player's overall financial wealth should rise numerically, and amount of transported material, too, but so should the prices as well! In the beginning the vehicles are old and small, thus everything must be cheap, and industry production lower. Logical. Second "counterattack" falls into different category. Narrow gauge vehicles are, if the term is interpreted precisely as a term, not so different from broad gauge. Tracks. Cars. Same engines - combustion, electric, steam. Same cargo handling, same infrastructure. Following this logic, there should be also broad gauge, funicular and rack (cog) railways, and more importantly, another special category for vertically capable aircraft (helicopters), zeppelins as well since their landing operations are different from aircraft, conveyor belts, heck maybe even flying saucers as a vehicle type (sorry Patrick ). That approach is not exactly what I would call reasonable. Sure, in the end all of these new vehicle types truly are justified in some way. That's why they exist in real world. But here we are within a game. What is the difference between these and what we have now? For all the mentioned aircraft, one new category is actually sufficient for purposes of a simulation game. The special railways are so rare - out of question as seriously used mode of transportation, too. Conveyor belts are too short to be plausible on our landscape scale. That leaves just broad gauge. What is so special about it? What about narrow gauge? The differences in real world were caused by more factors, but historical reasons aside, the ones we should take into account are terrain and moved cargo. For some operations it is practical to have vehicles as big as can be. On the other hand, sometimes there isn't enough space to even lay properly normal track. With this in mind, comparison with Simutrans world doesn't tell... much. Ways of all kinds take up a whole tile - and just one tile. No particular reason to differentiate in so fine aspects as track gauge. So what opportunities does a "vacant" waytype present in itself? I understand why it seems exciting - a whole new world, to be filled with new toys But this fun would be spoiled if it became just another railway, only with smaller looking track. In fact its representation as I outlined in my earlier post above does not differ that much from normal trains, even so. The difference had to be accented, thus the miniature visage for rolling stock and different pricing. There should be some reason for players to look at it and think, "wheeee! narrow gauge!" instead of "why is there just another railway?" Now I have left out one factor - realism. Of course it is possible to use narrow gauge for Japanese rolling stock models and let it be that way. Or, say, the Switzerland ones. But, what do we gain, and what lose? It's particularly funny that these two approaches (mini & realistic) are not necessarily mutually exclusive. After the "mini" epoch is over, the waytype can get completely new vehicle sets for the second part of 20th century. PS: All this rambling is on hypothetical, future extensions. Right now there are more pressing tasks than new modes of transport. Since when have we had a separate narrow gauge? Being one for realism I think that is cool! As narrow gauge was pretty big on the industrial transport side of things pre about 1930s in Britain, I'd be pretty keen to include that in PakBritain. A couple of questions though - does narrow gauge have different characteristics in any way? Narrow gauge is normally used on routes which are bendy and/or steep, as well as being cheap. The cost bit is easy to do, but is there a way of making the deceleration due to corners/hills less for narrow gauge? That would give them a niche in the game I think. Trolleybuses - characteristics: powerful, cheap operation, costly wires. Metro (if it ever appears) - the same. Maglev - none yet, but add into menuconf.tab for addons (Guthier & Timothy). Narrow gauge - still discussed. Old industries - just some ideas. Hood - afaik there is no difference program-wise from normal trains. narrowgauge was just recently introduced. Most major bugs were removed by around nightly r2006 and crossings worked from r2009 on. Yes, AFAIK it behaves exactly like normal track, except it cannot be connected to normal track (= also not to tram). It certainly only allows for much lesser maximum speeds (I think the fastest the Japanese can go right now is 160km/h - not much compared to the 300+ for normal gauge around the world) - but that doesn't need to be limited by ST - that's just for pak-maintainers to keep in mind. Are we talking about waiting for another new waytype, or what do you mean with "if it ever appears"? Because I think it could/should use either of the two track systems already available. So that would leave only vehicles and stations, right? And there are (or at least were) some vehicles available already. Some from the London Tube (by Timothy, I think) and on the Japanese sites, most (if not all) trains from the current lines of both, Tokyo Metro and Toei, are available, and on the German forum there are some from Berlin, too - IIRC. So what are we waiting for exactly? Underground... remember the licence project. From now on, the stuff that gets "in" must be already licensed. Or do you want to include things and then remove again? Or do you want to include things and then remove again? But we do agree that it is already generally possible with the current systems and items, right? Ah, right. We can include things on the spot if we get permissions (and if they fit into the set). That was exactly what I had in mind. Anyone know how easy that is to change? So, the next release definitely won't be "open" yet. But even if we do not include maglev and/or narrowgauge into the menuconf.tab yet - we should definitely remember to include symbol.MaglevStop.pak and symbol.NarrowgaugeStop.pak !